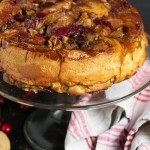 Delicious sweet and sticky rolls, filled with fresh cranberries and walnuts. Perfect for Christmas or a holiday breakfast or brunch. These rolls freeze beautifully! Simply wrap well and freeze, then thaw at room temperature for several hours still wrapped up. Re-warm slightly in the microwave, if desired. Grease an 8 or 9-inch cake pan and set aside. Combine 2 1/4 cups of the flour, the white sugar, and salt and yeast in a large bowl or the bowl of your stand mixer. In a small saucepan or the microwave, heat the water, milk and 2 Tbsp. of butter until warm. Stir into dry ingredients, then add egg. Mix in enough of the remaining flour to make it soft, but not sticky dough. Knead on a floured surface until smooth and elastic. Cover and let rise until doubled, about 60-75 minutes. Make the filling: In a medium bowl, combine the brown sugar and cinnamon and then cut in the butter with a pastry blender or two knives. Place 1/2 cup of brown sugar mixture into the bottom of your prepared pan. Add 2 Tbsp. water and stir together to make a sauce (may be a bit lumpy, but not to worry. The lumps are butter and that will melt). Scatter the whole cranberries and walnuts on top of the sauce. Set aside. When dough has doubled, roll into a 10 x 15-inch rectangle. Scatter the remaining brown sugar/cinnamon mixture evenly on the dough, then sprinkle the halved cranberries and walnuts on top. From the long side, roll up jelly roll style, trying not to pull or stretch the dough too much as you roll (aim for a gentle push This prevents the dough spirals from exploding upwards when they cook). Pinch the seam together and place on a cutting board, seam side down. Cut into 10 even slices, about 1 1/2-inches wide Place the slices cut side up in the pan. Cover with plastic wrap and let rise in a warm place for about 30 - 45 minutes or until the dough has puffed. Place cake pan on top of a baking sheet (*it will bubble over a bit!) and bake for about 35 minutes or until golden brown and hollow sounding when tapped. Remove from oven. Allow to rest for 5 minutes in the pan, run a knife around the outside, then invert onto a cooling rack with a piece of parchment on top or onto your serving plate, to cool. To avoid a gummy dough, allow to cool almost completely before pulling off that first piece (I know it’s hard to resist, but remember you can always warm it back up a bit with a few seconds in the microwave later).